The Institute for Research and Development (IRD) in New caledonia has started a long fight to give a legal personality to the Pacific Ocean. This achievement would give our ocean legal rights, defensible in court against companies, individuals or even countries that are hurting it. Only just introduced to the United Nations in New York , the project could take the form of a international convention. “Uien nore cele” is the name of the spirit of the ocean in Nengone, a language in New Caledonia. For the Maori people, it would have the “mauri”, the strenght of life, a spiritual power called “mana” in many Polynesian islands. But in regard to international law, it is just a big area of water, belonging to nations or to no one at all, fair game for pillaging or to treat as the world dumpster. Can an ocean have the same rights as a person? With the blessing of the head office in Paris , the IRD was urging the United Nations to acknowledge the Pacific Ocean as a legal entity at the first Ocean conference arranged in New York (5th to 9th june). “Recognizing rights to Nature as a person is not only a legal possibility nowadays, but probably the optimal next step in environmental protection policies”, argued the IRD. For non-lawyers, a legal entity is something that has a legal personality. By definition, only legal entities have rights. This privilege is given to natural persons (you and me) and to juridical persons (a county, a municipality, an NGO, a company…). Only humans and human organizations. But the concept of questioning the supremacy of Man over Nature is gaining new followers everywhere in the confetti islands of the Pacific. Henry Puna, Prime minister of the Cook islands, seemed convinced: “This is not such a radical idea. The ocean is our provider, our sustainer, our life force. She provides for us and nourishes us. Yet we mistreat our ocean with pollution, overfishing and the impacts of climate change such as ocean acidification, coral bleaching and more severe and frequent cyclones” said the prime minister in front of the United nations. “Whanganui, Ganges and Yamuna Rivers, Nature in Ecuador and Bolivia have already opened the way to think big in terms of Rights of the Nature” says the project initiator Victor David, researcher in public law, political sciences and legal anthropology at the IRD in Nouméa. The acknowledgment of nature’s rights helped by its cultural significance is making its way across the Pacific, as some voices have started to call for more consideration, notably for the ocean. “It does not only meet with cultural criteria – thus perceptions, and relationship with those elements – but also environmental criteria to protect the biodiversity” stresses the expert. This acknowledgment should also empower a better regulation of industrial activities, which the traditional legal system is having a hard time doing efficiently. But this very challenging project is only the beginning. What rights do we want to recognize to the ocean? On what area? Which countries are willing to follow? At the forefront of climate change, the island territories are directly involved. In the process, an international convention between states and territories will have to determine a “spokesperson” or a “guide”: the natural or legal person who will be responsible for representing the interests of the new legal entity. The IRD hopes that this agreement will become reality in 2020. Based on science, with the collaboration of oceanographer, this project could allow New Caledonia and other Pacific nations not only to be heard, but also to be a credible source of innovative solutions. 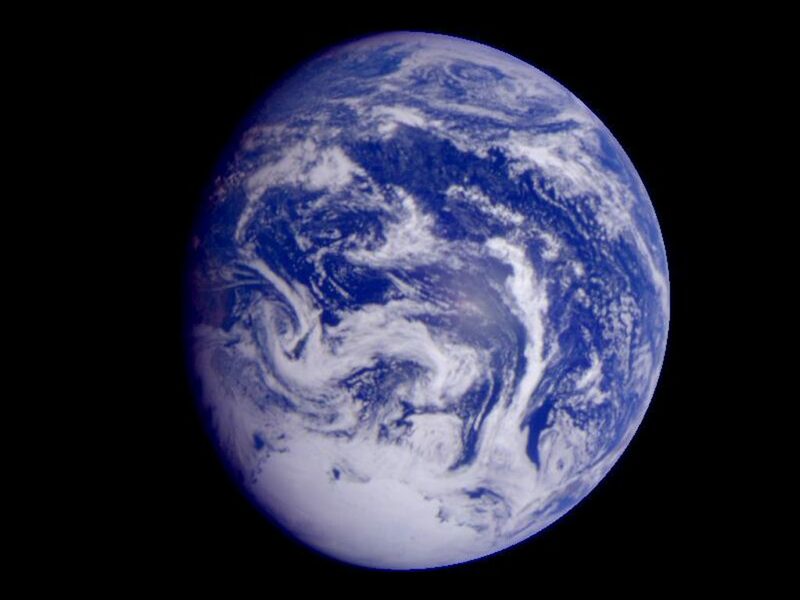 Photo: This picture of the Pacific Ocean was captured by the Galileo spacecraft in December 1990. It was 2.6 million km (1.6 million miles) away from the planet Earth. Credit: NASA. Next Next post: The Pacific is converting to solar… and it’s happening fast!